American Eagle Outfitters (AEO) is an American clothing and accessories retailer with close to 1,000 stores, headquartered in Pittsburgh, Pennsylvania. It was founded in 1977 by brothers Jerry and Mark Silverman. The brand targets male and female college students, although older adults wear the brand. They operate in more than a dozen countries. Probably with good intentions AEO launched an ad campaign in 2007 which used negative forms of gay stereotyping, in the form of a 12 episode web “sitcom” It’s a Mall World. The episodes appeared on their own website and are also premiered each Wednesday on TV during MTV’s Real World: Sydney. When a gay protagonist was introduced, he was a “mincing, lisping, pathetic portrayal of a gay man. One wonders how much the retail outlet paid for a marketing campaign that so effectively alienates their gay clientele?” – said NewNowNext. 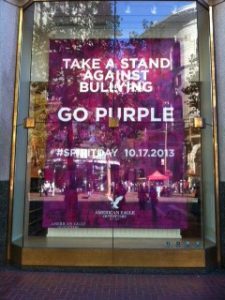 For a number of years GLAAD complimented AE for going purple to raise awareness about bullying against LGBT youth. 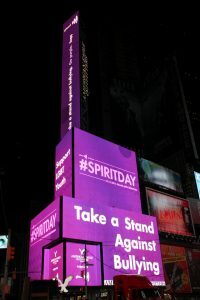 The billboard atop the retailer’s flagship Times Square store, a “four-level “spectacular”, had been including a Spirit Day message to go purple since the beginning of October. AEO showed off their spirit on the West Coast, too. The store in San Francisco’s legendary Market Street had Spirit Day-themed window displays. AE was “supporting partner”, along with Barilla, Chobani, and Toyota. “Presenting partners” were Wells Fargo and Target; among the “official partners” were DOW and Google. Past participants in Spirit Day include the White House, the Empire State Building, Oprah Winfrey, Ellen DeGeneres, Cher, Laverne Cox, Kim Kardashian, Demi Lovato, Ariana Grande, Shaquille O’Neal, Good Morning America, The Today Show, The View, The Talk, The Tonight Show, the NBA, the NFL, Major League Baseball, NASCAR, WWE, Facebook, Instagram, Twitter, Tumblr, the Las Vegas Strip, and more. A sign of support to New York’s Hetrick-Martin Institute, an advocacy group for at-risk gay youth, marked Gay Pride Month in about as prominent a way possible, in June 2015 (the ‘SCOTUS month’): with a video on the Times Square billboard showcasing the LGBTQ teens it serves. 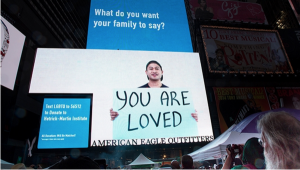 AEO was donating one minute of time every hour on its 15,000 square feet of LED screens. The campaign encouraged youth and supporters to share empowering messages with the hashtag #empowerLGBTQyouth. American Eagle has been a longtime supporter of the nonprofit. In 2016 American Eagle Outfitters was the proud a supporter of Pittsburgh Pride in 2016 for the fourth year. 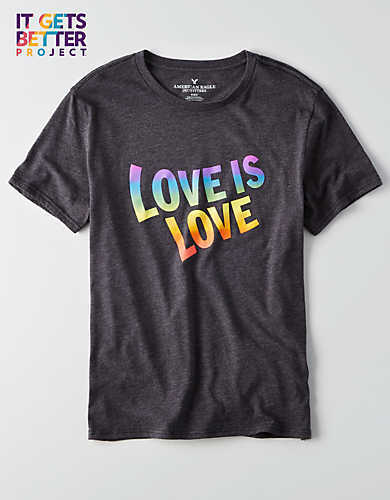 They designed limited edition “Love is Love” t-shirts, underwear and temporary tattoos that were sold in select stores and online. 100% of sales were donated to InterPride. 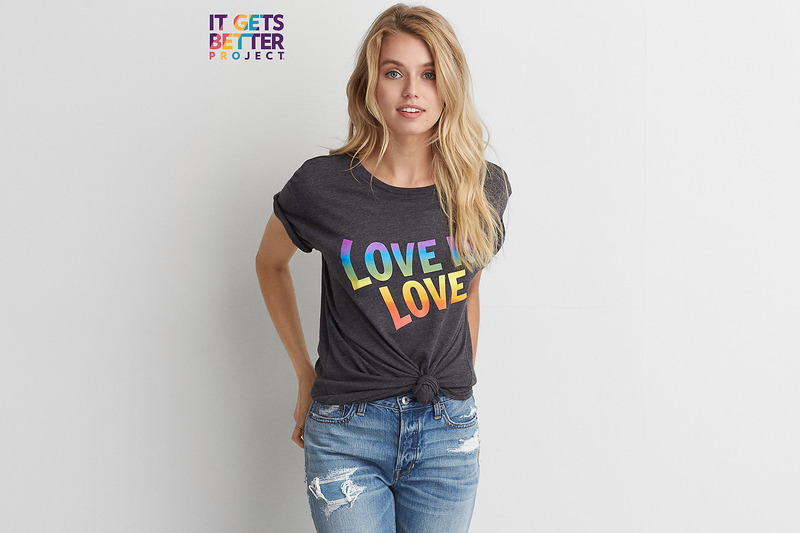 Their website features a Love Is Love section with a number of branded Pride and Rainbow items, with the heading Love Anyone, Accept Anyone and their general hasthtag #WeAllCan. 100% of the sales from the 2017 Pride Collection will benefit It Gets Better. Note: since 1999, Abercrombie & Fitch has sued American Eagle Outfitters at least three times for allegedly copying its designs and its advertisements. 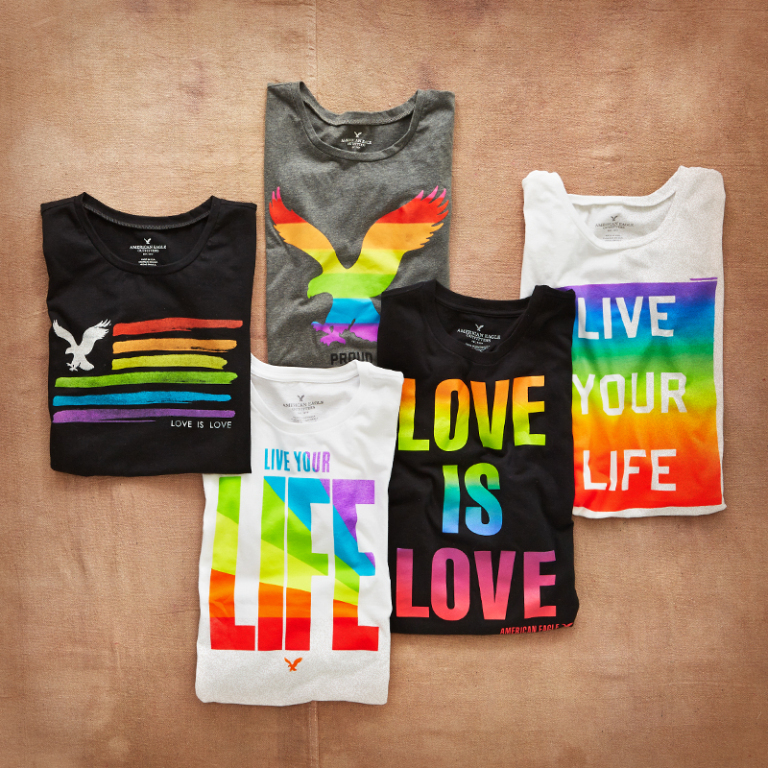 On all occasions, American Eagle prevailed in court under the statement that A&F cannot stop American Eagle from presenting similar designs, since such designs cannot be copyrighted in the United States. Nevertheless, American Eagle clothing designs have since trended away in appearance from Abercrombie & Fitch designs.